Since I had so much peanut sauce leftover from making chicken satays, I thought that I would make another batch of satays. Originally I was thinking about going with pork. 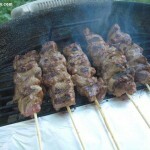 But on Saturday morning I was watching Primal Grill with Steven Raichlen, and he made beef satays on his Lodge Hibachi. 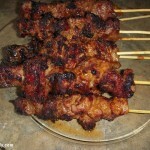 So after seeing that episode, it sealed the deal for me to make beef satays with some of the leftover peanut sauce. It couldn’t be more simple, in that I bought a ~3 lb chuck roast at the grocery and cut it into three 1 lb chunks. Two of them I ground into hamburger meat for future taco/chili/slider nights. And with the last chunk I cut it into 1/2″ thick slices and then cut the slices into 1″ by 1″ pieces. 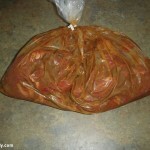 I then took all the cut up beef and placed it into a 1 gallon kitchen bag along with the 1 cup of satay sauce. 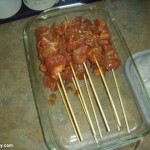 With everything all mixed up in the bag, I then placed the mixture into the fridge to marinate for about 4 hours. 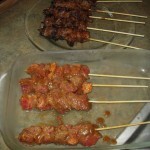 After the four hours, I then skewered the beef onto bamboo skewers so that there was about 4″ of beef on the skewers. 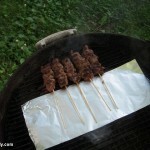 I then grilled the satays on the Weber for about 5 mins total. 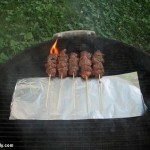 Since I’m using bamboo skewers, I thought that I would use a tip from Primal Grill when Raichlen made satays on the hibachi, in that he covered part of the grill grate with aluminum foil to keep the bamboo skewers from burning. 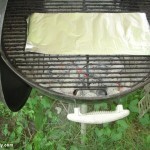 And it turns out that this actually works, as you can probably tell from the pics. 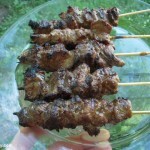 So maybe I don’t need to get a set of stainless steel skewers after all. Overall the flavor was pretty good on the satays, and the beef seems to better complement the peanut sauce verse the chicken. The only downside is that the beef was a bit on the chewy side, but that’s what I get for using a chuck roast. Maybe if I marinated the beef for longer (24-48 hrs) before skewering it might get a little bit more tender, but I kind of doubt it. 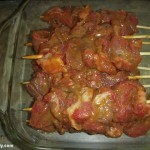 I’m thinking about maybe using a ribeye steak, like Raichlen did in his satey recipe for the next time I make satays. So if you happen to have any tips on a better beef cut to use, please let me know.